Register Online Here for Boy’s 2019 State Championship Tournaments! The following documents are REQUIRED or each athlete for ALL District (State) Tournaments. 2. Copy of current Report Card REQUIRED for 5th, 6th, 7th, 8th, 9th, 10th to 11th Grade Tournaments. 3. ONE of the following: Walker ID/Child ID OR Passport OR Military ID or Driver’s/Learner’s Permit. Birth Certificates will NOT be accepted. 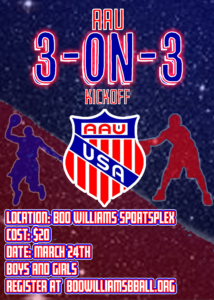 Due to the mandatory AAU Background check policy; all bench personnel will be required to show a government issued ID at check-in to receive their complimentary tournament entry pass. Passport, Military ID, Driver’s License or other accepted forms.